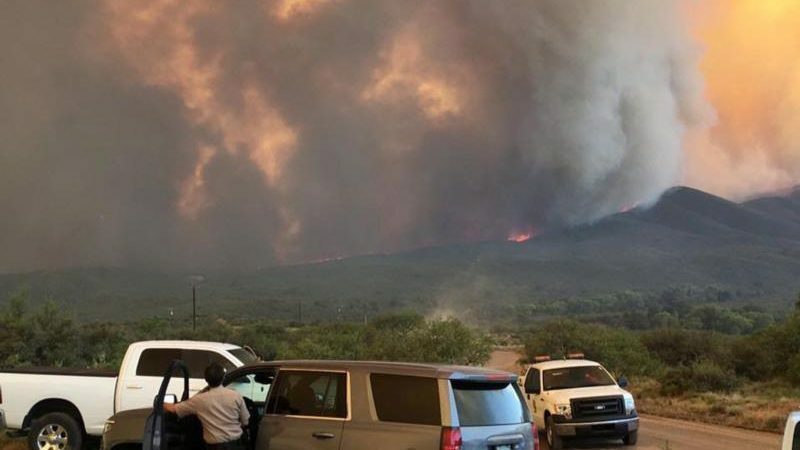 PHOENIX (CNS) — Residents of the town of Mayer, including roughly 100 families who regularly attend Mass at St. Joseph Mission, were allowed to return home June 29 after evacuating for a time because of the Goodwin Fire burning in the nearby Prescott National Forest. The fire started June 24 and authorities were still investigating the cause. As of early July 2, it had burned more than 27,000 acres and was 53 percent contained, according to the Arizona Department of Forestry and Fire Management. More than 1,200 firefighters were on the scene. News reports said the blaze had forced an estimated 7,500 people from their homes and campsites. A spokeswoman for the U.S. Forest Service told reporters the Arizona fire was expected to grow because of high winds. At least one wildfire was burning in each of four other states — California, Washington, Utah and New Mexico — following a heat wave in the Southwest. The blazes were fueled by high winds. Father Alphonsus Bakyil, who is pastor of the 102-year-old St. Joseph Mission, said many Mayer parishioners escaped by visiting adult children in Phoenix or Flagstaff. The priest, a member of the Society of Our Lady of the Most Holy Trinity, was safe at his other home in Camp Verde. He also is pastor of St. Frances Cabrini. Others, like Jesse Bais and his wife, had headed to a friend’s place in Prescott Valley, but they were among those allowed to return June 29 when evacuation orders for Mayer were lifted. Several major road closures remained in effect and many, like Bais, were without power for the first couple of hours. Bais has lived in Mayer for 66 years and this was his first evacuation experience. The Red Cross set up a shelter at a Prescott Valley high school, where about 60 people sought refuge. Residents across Arizona took to Facebook and other social media to offer transportation of pets and boarding space. “Right now, the Red Cross is saying they have everything they need,” said Darrel Reynolds, site director for Catholic Charities in Prescott. “The community has responded very, very well to the need of help,” he said June 29 in an interview with The Catholic Sun, newspaper of the Diocese of Phoenix. Reynolds also praised the work of the firefighters. A couple of people did stop by his office in need of food as a result of evacuation orders. Staff connected them to a nearby food bank. Parish staff at St. Germaine in Prescott Valley north of Route 69 were monitoring the situation and stood ready to connect with parishioners through Flocknote, a text and email messaging service for churches, and other means to offer assistance for those affected by an evacuation. “Although some evacuations have been lifted and roads reopened, property owners are urged to remain vigilant and monitor fire news. There is still active fire behavior, particularly in the northern portion of the fire, and conditions can change easily if impacted by high wind events,” the Arizona Department of Forestry and Fire Management said in its July 2 update about conditions. Representatives from Catholic Charities Community Services’ northern locations said they were on standby to offer local support if needed. Staff members were distributing fliers to the populations they serve to prevent long-term stays in the national forests. Many homeless individuals camp out for extended periods of time so staff are constantly reaching out to them to offer resources. Rick Brust is a team lead for Catholic Charities’ PATH program, or Projects for Assistance in Transition From Homelessness. He told The Catholic Sun, Phoenix’s diocesan newspaper, that his team promotes fire safety and restrictions. “Since private land is hard to find and liability issues may arise regarding camping for the homeless, more affordable and subsidized housing is needed to offset the possibility of forest fires,” Brust said. “Most homeless individuals and families that decide to camp within our forested regions are for the most part, respectable of maintaining clean campsites and remain aware of the fire restrictions that may be in effect.